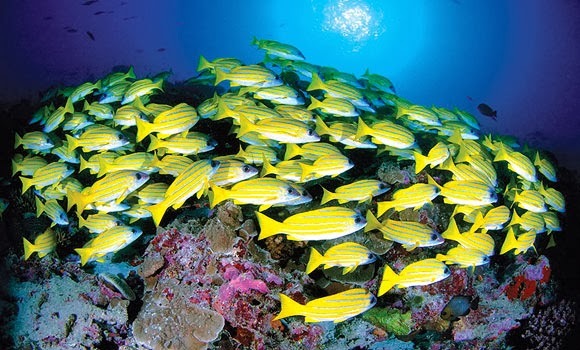 The Mason’s Travel Reef Safari excursion is Seychelles 101 – a full day jam-packed with activities and adventure. Sail the seas, dip beneath the waves to another world, taste Creole cuisine, meet the giant tortoises and discover pirate graves on the world’s smallest national park. This value for money excursion is a must for anyone visiting Seychelles, and is a great day’s fun and a thorough introduction to all that these beautiful islands have to offer. Start the day off early and hop aboard Anahita, one of Mason’s Travel’s catamarans as you set sail for the St. Anne Marine Park. This journey takes you on a tour of Port Victoria, past yachts, fishing boats, cargo-carriers and warships as you head out to explore the islands of the St. Anne Basin. Transfer to Semi-Sub, Mason’s Travel’s semi-submersible vessel for your private underwater tour of the colourful coral gardens of the marine park. Get up close and personal with various species of tropical fish, crustaceans, rays and – if you are a lucky – a turtle or two. Back on board Anahita you will have the time to relax and bask in the Seychelles sun before enjoying a traditional Creole lunch, affording you the chance to taste the flavours of Seychelles cuisine. Anchored in the marine park, you will have the chance to swim and snorkel in the warm, calm, crystal clear waters and discover the creatures that inhabit the coral gardens. All equipment is provided. Take a tour of Moyenne, the world’s smallest national park. Hike around the island and visit the forests and beaches along the trail. Visit the chapel, ruins, museum and grave sites (two of which are believed to belong to pirates!). Also have the chance to get up and personal with a population of Seychelles’ friendly giant tortoises that roam freely on Moyenne. Not in the mood to explore the island? No problem – relax on the beach or take a swim in the tranquil waters around the island. Return to Anahita for the return journey and sip complimentary cocktails as you slowly make your way back to port as the sun begins to set on another glorious day in paradise Seychelles.